The Legal Genealogist knows what you should be doing — and what I’ll be doing. I’m going to be attending the U.S. National Archives Virtual Genealogy Fair — it’s online and it’s free. It’ll kick off tomorrow morning at 10 a.m. EDT via live stream from NARA’s YouTube channel with opening remarks by David S. Ferriero, Archivist of the United States. That’ll be followed by 10 terrific presentations over two days about the records of the National Archives — and tips and tricks for genealogists and family historians — taught by genealogy experts from National Archives locations across the nation. Learn how to do basic genealogical research using Federal records at the National Archives including census, immigration, and military service and pension records. Mary Lynn Ritzenthaler will discuss and demonstrate how to preserve family papers and photographs, similar to her last year session (on YouTube, starting at 1:13). This will be followed by a question-and-answer period designed to meet your needs and interests. Her talk covers how to preserve family records and then safely mount, frame, and display them. She will also discuss the factors that cause damage to paper and photographs and how to store them in an environment that ensures their preservation. After her talk, have your questions ready! This presentation will provide an overview of the extensive holdings of the National Archives at St. Louis. This large Federal archive is home to tens of millions of personal data series records including the official military personnel files of former military members of all branches of the U.S. military, official personnel folders of former Federal civilian employees, selective service registration cards and ledgers, various courts martial records, individual deceased personnel files of former military members, and Veterans Administration deceased claim files, among many others. Attendees will be given an overview of these records, how to request them both on-site and off-site, and additional resources for further research. The National Archives–St. Louis holds two dozen records series that are in card form, and most of them are not well known. They provide valuable information for researchers who are reconstructing the service of a veteran whose personnel file was destroyed in the 1973 fire, and for those who want to learn more about their civil servant ancestors, as well. Genealogists will find they contain names and addresses; birth, death, and service dates; and many other personal details. Among the records we will discuss are World War I Award Cards, Air Force Award Cards (1942–1963), Arlington National Cemetery Interment Cards, Philippine POW Cards, VA Master Index Cards, WWI and WWII Pay Cards, Selective Service Cards, Civilian Service Record Cards, and more. We will also discuss records that are related to the cards and explain how the cards can provide leads to additional information. 2.5 million men served in the Civilian Conservation Corps (CCC) between the years 1933 and 1942. The National Archives at St. Louis maintains and makes accessible the personnel records of these individuals; the records contain information about each individual’s service and often include educational, family, and work details about life prior to joining the CCC. Join this presentation in order to learn more about the genealogical information that can be found in these files and the request procedures for gaining access to these files. Our ancestors were mobile, and families moved, sometimes across an ocean but just as often via land routes to the western frontier. Where they went, how they got there, and why they moved adds flavor and depth to our research and family knowledge. This lecture outlines some of the Federal and local records that can be used for this research. The Electronic Records Division of the National Archives holds hundreds of thousands of records in its custody. Many of the records of the division are of great interest and are helpful to genealogists looking to fill in the gaps in their family histories. In this presentation, John LeGloahec, an archives specialist with the Electronic Records Division, will highlight the wide range of records and access tools that can assist researchers in finding their roots. John will also highlight NARA’s Access to Archival Databases (AAD), which provides item-level records to researchers on a variety of subject areas. Every year, the Electronic Records Reference Branch receives thousands of inquiries about the holdings of the Electronic Records Division. Many of these inquiries concern military service or casualty information, which is what this office makes available most often. Within AAD are more than 100 million “stand-alone” records that are easily understood on their own and do not require supporting records. This presentation highlights the records and resources at the National Archives at St. Louis utilized to locate military service information concerning World War I Veterans. It details multiple record series, including but not limited to, Official Military Personnel Files, Deceased Veteran Claim Files, World War I Burial Files, and General Courts-Martial records. It will include all records that are available to the public and an overview of the information and documents typically found in these files. Procedures will also be explained for how to access these records for both on-site and off-site researchers. During the First and Second World Wars many government agencies hired female employees to both aid in the wartime efforts and to perform jobs previously filled by men. This employment created an extensive paper trail in an area that is traditionally harder to track: female genealogy. Genealogy for a woman’s family can be more difficult to track due to the traditional taking of the man’s last name. The civilian Official Personnel Folders of various departments, such as the Department of the Army/Air Force (Department of War prior to 1939), Department of the Navy, and Department of State, often recorded the maiden names of married women as well as their parents’ names and addresses, and sometimes even their mother’s maiden name. These records include addresses of the employee throughout employment and post-employment for retirement benefit purposes. I will cover the content of these series and how they can aid in genealogical research specifically pertaining to female employees. The United States has seen many economic “ups and downs.” Rich and poor alike have seen their finances crash, and have been left with no option but bankruptcy. Bankruptcy records contain a wealth of details that can be found in few, if any, other places. These facts can include items owned by an individual or company as well as a listing of whom they borrowed from. This class will take a look at what bankruptcy records are available, what type of information can be found, and demonstrate how to research the records. So where will I be tomorrow and Thursday? At the Fair, of course. My mother’s father was in World War I. My uncle was in the Civilian Conservation Corps. And most of my family has always been broke. So where else would I be but at the Fair? 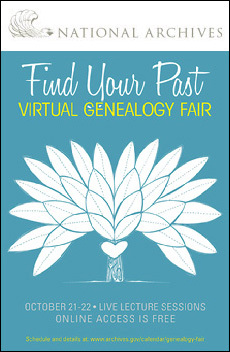 Come on out and join me, at the National Archives Virtual Genealogy Fair! And, as always, if you have to miss one of these presentations in real time, they’ll be recorded for viewing later on NARA’s YouTube channel. Thanks for alerting me to this, Judy. I’ve had NARA on my “very important must get to this” list for a while now. I knew the many kinds of important records they hold, but was intimidated by the fact that so little is online. (I think I kind of pictured a musty, rigid hoard of paper-hugging bureaucrats). But I made a date with myself to watch these presentatios, and was totally hooked from the beginning. These are really nice people who are dedicated to helping us find the records we need! Not only that, but they really care about the people whose musty old records they are working incredibly hard to preserve, digitize, and someday index! I’m blown away. I was adding scribbles to my list of things I need NARA for, and found myself immensely grateful that such a great group of people are there for people like me and you and all the rest of us trying to pry our ancestors out of the mist of time and into something we can visualize and understand. I rearranged my schedule so I can be home tomorrow for day two. And I’m excited!